Once again this year, we have some very exciting news to share with you! Thanks to our initial sponsor support, world tennis legends, Aaron Krickstein and Jimmy Arias have agreed to return for a re-match and participate in the pro exhibition event during our annual Scott L. King Serving Aces for Sarcoma Junior Tennis Tournament. 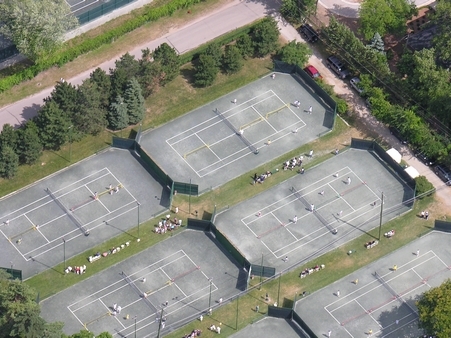 The U10 Tournament and Pro Exhibition will take place July 17, 18, and 19, 2015 at the Birmingham Racquet Club and the Bloomfield Open Hunt Club, respectively. Jimmy Arias, originally from Buffalo, NY, was the first of many child prodigies to come out of the Nick Bollettieri Tennis Academy. Jimmy's powerful baseline game and forehand carried him to a career high world ranking of #5. He reached the semi-finals of the US Open and won the Italian Open in 1983. He went on to win three other ATP tournaments and represented the US Davis Cup team five times. Jimmy also has one grand slam title; winning the French Open Mixed Doubles Championships with Andrea Yeager in 1982. He has career wins over Boris Becker, Andres Gomez, Pat Cash, and Aaron Krickstein. Jimmy is now one of the lead announcers for ESPN. Aaron was born and raised in Grosse Pointe, MI. He was coached by pros synonymous with Michigan tennis; Joe Shaheen, Ian Harris, and Brian Marcus to name a few. Aaron moved to Florida at age 16 and attended the Nick Bolletteiri Tennis Academy. During that year, he was the youngest player ever to win a Grand Prix event. This was at Tel Aviv in 1983. Aaron achieved a top ten world ranking in August 1984 and was the youngest player ever to be ranked in the top 20. He attained a career high world ranking of #6 in 1990. Aaron reached the semi-finals of the US Open and the Australian Open and won nine career ATP singles titles. He represented the US in Davis Cup play for five years and was a teammate of Jimmy Arias for a few of those years. Aaron has career wins over Stefan Edberg, John McEnroe, Brad Gilbert, Michael Chang, and Jimmy Arias. He currently competes on the Champions Senior Tour and is the Director of Tennis at St. Andrews Country Club in Boca Raton, FL. We are honored to showcase these world class athletes to our community and our young aspiring tennis players. The game of tennis offers so many lifelong lessons. This event will shed light on the great journey of junior tennis starting with the youngest of ages and continuing through high school, college, and even professional. Having Aaron Krickstein participate makes the event very special. He grew up and started his junior tennis career right here in our Southeastern Michigan Community, similar to how our local juniors are doing it today. To become a Sponsor or Purchase Tickets to any of the Pro Events, click on the Documents page.